Transportation, civil engineering and general light work, etc., Transportation, civil engineering and general light work, etc. * Due to allergic reaction, depending on the constitution, cause itching, rash, eruption. If you feel abnormal stop using, please consult your doctor. * Do not touch the hot things of 60 degree or more. There is a risk of burns. * Do not use the machine w, * Due to allergic reaction, depending on the constitution, cause itching, rash, eruption. If you feel abnormal stop using, please consult your doctor. * Do not touch the hot things of 60 degree or more. There is a risk of burns. * Do not use the machine work with a rotating part. * Since there is a risk of electric shock, do not use the electrical work. * Storage keeping away from direct sunlight. * Do not use for high concentrated chemicals and solvents (gasoline, benzine, etc.). * After using, wash it in the case of getting household detergent, bleach, oil, etc. Because the palm side is rubber, without changing the gloves you removed the tire Just wash it and it's very convenient. Unlike rubber gloves, it is also good impression that it doesn't stick or stick. This review is about item#2146996. Anyway, it is good to be cheap. Better if you have a small size. The rubber peels off when it is washed. Because it is a feeling that thick gloves are coated on gloves, It is inevitable for work requiring delicacy. Is not it good for stray work? Civil work and dirt picking etc. to dirty work. I usually use L size gloves but it seems to be larger than that size. It seems that it is about the same as general rubber gloves in terms of strength. As soon as it gets dirty it is replaced with a new glove and it is using a gun gun, it is washing and reusing it collectively after the work is finished, I wash hands three times and squeezed by hand repeatedly but there are no gloves that have yet been defeated. I did a good shopping at a cheap price. It seems to be even better if you let me choose the size. 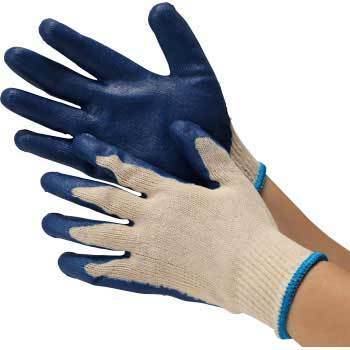 The price is cheap as rubber gets peeled off with several times of use, but it is more economical to use thin gloves (natural rubber coat) for repeated use. I think that if it is intended to be disposable it will be a soft feel. I think that it is inexpensive and it is very good product without tightening. I think that it is okay to keep it as it is, I would appreciate it if you could sell it a dozen. I am using it for tire work. " Rubber strength is weaker than I thought. It is a hole immediately. Although the dismantling work is mostly machine work, manually handling various things such as wood, rubble, hardware, oil stains and the like. With these operations, the rubber gloves must be discarded in almost one day because the dirt does not fall off due to washing. This also applies to thick rubberized gloves. This product is excellent in cost performance and used satisfactorily. It is a difficult point to smell, but I think that convenience is good if it thinks it is disposable because it is cheap.